There’s no question about it, females have taken great strides in gaining acceptance and inclusion on the ice. From players to coaches and officials, girls and women in hockey are gaining in number as the sport continues to grow as a whole. Why not add female officials to the mix? USA Hockey: Your first professional game on the ice – pretty cool, huh? Erin Blair: It was a lot of fun. (To me) it was just another hockey game, and I have a lot of fun no matter where I’m officiating. I got to work with a great crew and the league, teams and both coaches were awesome. The SPHL commissioner (Jim Combs) and league officiating scheduler (Mark Faucette) really made us feel welcome. Katie Guay: It was a lot of fun and definitely one of my most memorable games (to officiate). I wasn’t expecting the call from Matt Leaf at USA Hockey, but when he shared that this is a great opportunity for Erin and myself, it was something I couldn’t pass up. USA Hockey: How did players and coaches react to females making the final call on the ice? Blair: They were your typical hockey coaches and players, but they didn’t treat us any different just because we’re girls. If they had a question or a complaint, they certainly expressed their opinion. We did our job just like any other official would. Guay: It was great. The guys didn’t treat us any different out there on the ice and I think that was a great sign of respect on their part. They definitely treated and spoke to us like they would have any other league official. We heard it all out there. 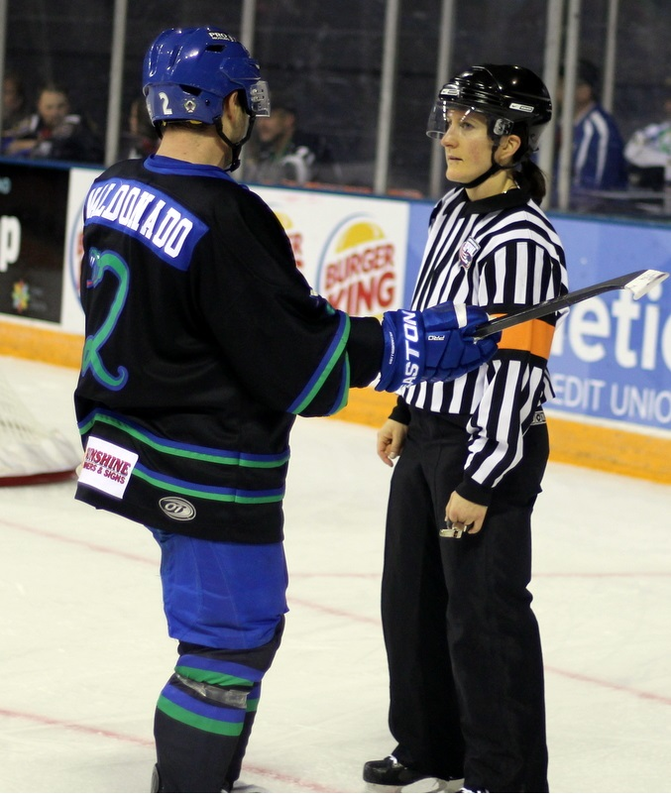 USAH: You both officiate mostly women’s games. What was the biggest difference in the men’s game? Blair: The only real difference I noticed was the fighting. I haven’t worked any hockey games where fighting is any part of it, so to me that was an eye-opener. I think we were maybe two or three minutes into the game and a fight broke out. Katie and I both looked like a deer in headlights, but it wasn’t anything that we couldn’t handle. It actually made it a little bit more fun because it was something neither of us had worked before. Guay: I prepared for that fighting difference a little bit. I looked at some box scores and talked to some guys who work the league and they all said that fighting was pretty regular for that league. Two minutes in and they dropped the gloves at center ice and it made for quite the first experience. They made sure to top it off with a couple more fights later on toward the end of the game so we both definitely got the full experience of the SPHL. USAH: While this was big time, you both have lots of experience that led up to this. Talk about your officiating road a little bit. Blair: It’s been pretty amazing. I earned my international crest in 2003 and I’ve worked 10 different international tournaments from 2004 up to last year’s Olympics (in Sochi). To be a part of (the Olympics) was something I have wanted since I was a player. Add in collegiate hockey and the chance to work some NCAA championships and I have to admit that it’s been quite the ride. Guay: I’ve had the opportunity to work a few international tournaments including a (Women’s) U-18 tournament in Budapest, and this spring I am heading to Sweden for the (Women’s) World Championships, so I’ve received some amazing experience. I usually work Division I and Division III collegiate games in the Eastern Collegiate Athletic Conference and Hockey East and have done some national championship tournaments, too. I’ve had an array of experience but this was by far one of the most exciting ones. Realizing what a big step this was for females and officiating, I am excited to be a part of that. USAH: What got you into officiating? Blair: I’ve been around hockey since I was little. I played goalie up through college at the University of Findlay. While I was in school there, I started officiating to help with money. Truthfully, that was the only reason I was doing it at the time. By the time I was a senior in college I had already climbed the ranks in USA Hockey pretty quickly. Once I got that taste, moving up to be the best I could be became my new goal. Guay: After playing at Brown University and on the U.S. Under-22 (National) Team, I just wanted to find a way to stay involved in the game and I thought I’d try (officiating) out. USAH: Did you ever see it leading you this far? Blair: I always had an aspiration to play for a national team. Once I got into (officiating) and found out what was out there and what I could do, I was hooked. I’ve been very lucky. Everything fell into place for me and I’ve been incredibly fortunate to be given the opportunities I have. There are so many girls that could do exactly what I did and excel, so I’m just extremely appreciative to be able to do this. Guay: I had hoped it would. It became a goal of mine once I got involved to go overseas and do a tournament. Every opportunity that came my way, I went for it. I definitely don’t take any of it for granted and I just hope to continue to excel and work the next big game. USA Hockey: Is another SPHL game in your future? Blair: I‘m heading back for another game on Jan. 9. During that game, I’ll be working with up-and-coming official Jamie Huntley. A big part of that game will be her learning. I am really looking forward to being there for it. Guay: I got the call to work with Erin again on the Jan. 9 game, but unfortunately, with my college (game) schedule, I couldn’t make it happen. If I could do it again in the future, I’d definitely consider.